The X-Weigh excavator scales from LOADRITE NSW are designed to take the guesswork out of loading trucks accurately, providing the traceability and accountability required when moving hazardous materials. Tracking the movements of hazardous materials is particularly important in project alliances as the chain of responsibility extends across several people who may be held liable for accidents or breaches in workplace health and safety or environmental legislation. Owen Hayford is a partner at Australian law firm, Clayton Utz, specialising in privately and publicly funded infrastructure projects and a key part of his job is to identify and mitigate risks. He explains that minimising the risks associated with the management of hazardous materials is essential on every project to ensure the safety of contractors, the public and the environment, and to avoid incurring the costs, which inevitably result from any incidents that may occur. Though such risks are traditionally the responsibility of the contractor, however on a project alliance, the owner and the contractor share in the rewards as well as the risks of the project. 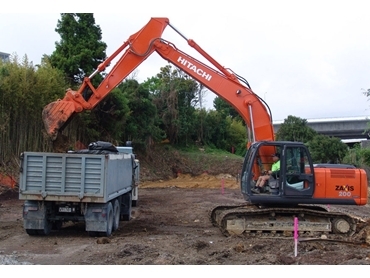 According to Loadrite Excavator Product Manager, Gordon Hain, it is important to know when moving hazardous materials in particular, exactly what material is being moved, how much of it is being moved and where that material is being taken. This traceability is important for economic reasons, safety reasons and environmental reasons as the materials need to be disposed of appropriately. Gordon observes that it is extremely important while loading any material for disposal onto trucks, especially hazardous or variable materials to ensure that the trucks are neither overloaded nor under-loaded. Accurately measuring materials as they are loaded into trucks can save a company significantly in terms of financial risk. While overloading with any material is unsafe and can lead to fines, consequences of overloaded trucks hauling hazardous or toxic material can be worse with an accident liable to cause spillage, injuries or fatalities, and the financial and moral responsibility travelling all the way through to the top of the chain of command. Under-loading can be costly too, as it can impact the profitability of the trip. Hazardous materials also often need to be disposed of at a specialised site, incurring higher fees than a regular dump site, in which case contractors have to know exactly how much material is being dumped by each truck to ensure correct payments. An automated system such as the Loadrite X-Weigh scale enables the user to accurately track all of these elements, taking the guesswork out of loading trucks, and providing the required traceability and accountability. Once the truck is loaded correctly, the driver collects a printed docket from the excavator operator or at the site gate, depending on the location of the system’s printer. The docket can show the truck payload, weight, type of material and the truck’s destination as well as time and date and a docket number to identify the specific loadout event. Gordon explains that when the information is reconciled at the end of the day, week or month, there will be a unique identifier for each truckload, which is stored and is also reportable for future tracing requirements.